Hu Bo’s An Elephant Sitting Still will play three more times at the Northwest Film Forum: twice on Sunday 4/14, and again Wednesday night 4/17. This 230-minute film is a fascinating thing to sit through: dismal and dim in its photographic palette, confident in its blocking and composition (the latter unfolding within very, very long takes), shrewd in its fully-imagined characters. The way information gets doled out feels highly original—for instance, in the casual but carefully-arranged manner in which we suddenly realize that two characters are related. The film’s view of the world—without color, without light—is like a glimpse into a dark funk of depression. The filmmaker committed suicide, age 29; this is his only feature. In another sector entirely, the new Hellboy film did not screen in advance for the press, which, if the early reviews are to be believed, is beginning to sound like a great blessing. These films were preceded by a pair of enjoyable H-boy pictures directed by future Shape of Water Oscar winner Guillermo del Toro. My reviews of those films, both published in the Herald, are printed below. I enjoyed both, but I sound a little skeptical. And if you get to the end, you’ll see that del Toro was still touted as the director of the Hobbit pictures at this point. The newest movie based on a comic book (until Punisher comes along in a couple of weeks), Hellboy lacks the fame and the history of Spider-Man. But this is easily one of the better film adaptations of a graphic novel. Hellboy was created in 1994 by Mike Mignola. According to the movie, written and directed by Guillermo del Toro, Hellboy arrived on earth in 1944, sneaking through an occult portal devised by the Nazis. The portal was destroyed, but not before a bouncing baby boy—with red skin and little horns on his head—popped through. Hellboy, or “Red” as he is known, grew up into a near-indestructible crimefighter with a wicked right forearm. He’s been raised by Professor Broom (John Hurt) and enlisted in the secret ranks of the Bureau for Paranormal Research and Defense. Don’t bother Googling the B.P.R.D.—the government doesn’t want you to know about it. The character of Hellboy is played by Ron Perlman, and this is key to the movie’s success. Perlman is a witty actor who frequently hides his massive face beneath makeup, as in the TV series Beauty and the Beast or the movie Quest for Fire. 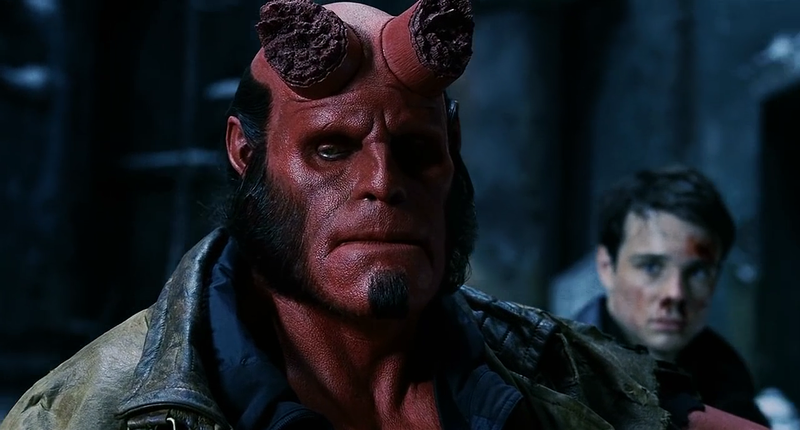 With his scarred red skin and freaky features (he sands down the horns, actually), Hellboy is yet another huge makeup job for Perlman. And yet, as Perlman has so often proved in the past, a good actor can express a great deal of personality even through a mask. And Hellboy has personality to burn. He’s cocky and sarcastic, but his sensitive side turns protective toward his colleague, the tormented firestarter Liz (Selma Blair). And he’s good enough with the one-liners to make Arnold Schwarzenegger raise an eyebrow. The movie’s plot circles around to Hellboy’s beginnings, as the reconstituted Nazis return to unleash an evil creature on the world, which is merely prelude to inciting the apocalypse. Well, isn’t that just great. Two brutal sequences in the New York subway is probably one too many, but this is the rare action film where all the computer-generated effects and things blowing up are clearly subordinate to a story about characters. Yes, comic-book characters, sure, but within those outlines the film plays fair. The cast includes a newcomer, Rupert Evans, as a new agent teaming with Hellboy; Jeffrey Tambor as the oily head of the B.P.R.D. (he has a brilliant climactic moment with Hellboy, sharing a cigar); scary dude Karel Roden as Rasputin (he still hasn’t been killed); and Doug Jones as an aquatic empath, although the character’s voice belongs to an uncredited David Hyde Pierce. At least, I assume it’s David Hyde Pierce; if not, he should sue. Mexican director del Toro has made some chilling Spanish-language films (Cronos, The Devil’s Backbone), but this is his best Hollywood outing yet. Hellboy has an elegant visual flow that feels loyal to its comic-book origins but not constrained by them, and it has a melancholy romantic spirit. You can’t ask for more from a movie called Hellboy. 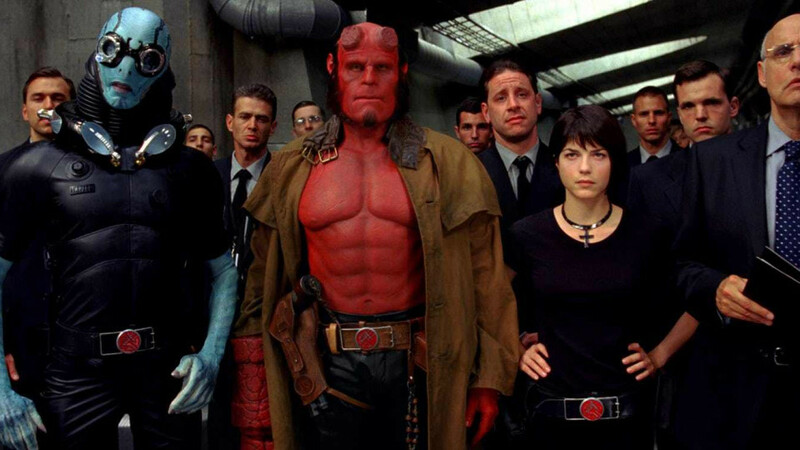 The first Hellboy movie was exactly right as an under-the-radar superhero movie: it emphasized character over effects, it used humor in liberal doses without selling out its dramatic storyline, and it burst into occasional visual splendor thanks to its imaginative director, Guillermo del Toro. After that 2005 film, del Toro scored an Oscar-winning success with Pan’s Labyrinth, and his sequel, Hellboy II: The Golden Army, looks like the work of a filmmaker unleashed. This movie has even more fantastical creatures and wild designs. It’s also got more story (del Toro kicked up the idea with Hellboy comic-book creator Mike Mignola). More, perhaps, than the director knows what to do with. We don’t waste much time on exposition. But there is a flashback to Hellboy’s youth, as he listens to a fairy tale read by his minder (John Hurt, doing cameo duty). Then it’s back to the adult Hellboy, still reluctantly working as a government agent–and played again by Ron Perlman, the actor whose interestingly-sculpted face has never known fear of latex. In case you’ve forgotten, Hellboy is red, grouchy, and almost indestructible. His horns have been sawed off to a manageable level, and his mighty right hand is potent enough to knock villains across the room. He’s still pals with watery creature Abe Sapien (Doug Jones), and still romantic with firestarter Liz (Selma Blair). They must battle a prince (Luke Goss) who seeks to break a millennium-old pact between humans and the fairy folk. Perlman ruled the first Hellboy, but here the new characters and the democratic inclusion of storylines for Abe and Liz leave him somewhat on the sidelines. And del Toro, whose narrative coherence hasn’t always kept pace with his wonderful visions, goes on a variety of fishing expeditions in the first half of the picture—some of them fun, some of them just kind of weird. The good stuff kicks in when the focus narrows in the final third. Maybe it’s the drunken male bonding scene between Hellboy and Abe, or the inclusion of a certain Barry Manilow song on the soundtrack, but the movie takes flight and maintains its crazy energy through the end. Given the prominent placement of a dire prediction about Hellboy, del Toro must be planning a third installment. Squeezing it in around his assignment on The Hobbit might be difficult, but well worth anticipating.